Even those of us lacking a single green thumb can grow a handful of tasty and restorative herbs. They're that easy. And from a little effort in the dirt, you'll soon find yourself simmering homemade salve and flavoring your food with the leaves of your labors. 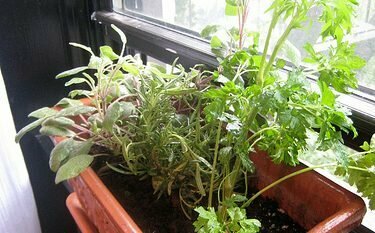 Most herbs grow happily on sunny windowsills as well as in garden beds. Pick up your chosen seedlings at any local garden center, along with some soil and pots, if needed. Then just set your freshly potted herbs on a south-facing windowsill or wait until after the last frost and pop the seedlings into the earth. Add water, sit back and watch the growing take place. It's no surprise that these four herbs are hummed together; they're the perfect culinary basics. And all four do well outdoors in warm, sunny areas. Rosemary and thyme are perennials, meaning once you plant them they'll come back every year. So will sage in milder climates. Little or no garden? No problem. They do quite well in cramped quarters or pots. Beyond their flavor contributions, these herbs pass the ‘good for you' test, according to Zoe Gardner, program coordinator of the University of Massachusetts Medicinal Plant Program. Parsley has received little attention from researchers, says Gardner, but it has traditionally been used to treat indigestion (just ask Peter Rabbit!). Plus, it's high in vitamins A and C, fiber, calcium, iron, magnesium, potassium and riboflavin. Sage has received more scientific scrutiny: It improved both mood and cognitive functioning in a 2005 study, reported researchers in Neuropsychopharmacology (yes, that's really its name). And patients with mild to moderate Alzheimer's disease who were given sage extract scored significantly better on cognitive tests than a comparison group given a placebo, according to a study published in 2003 in the Journal of Clinical Pharmacy and Therapeutics. While adding a handful of sage to a favorite sauce probably won't improve your brain capacity, this herb clearly has some benefits that go beyond the plate. There are plenty of reasons that rosemary is a ‘must grow' kitchen herb (rosemary and caramelized red onions, for one). The extra benefit comes in the form of antioxidants, those powerful compounds that are believed to help prevent cancers and support heart health. As for ‘rosemary for remembrance,' that saying dates back to ancient Greece, when students believed wearing sprigs of rosemary in their hair would fortify the memory (if only). Thyme also contains anti- oxidants but its traditional uses – relieving mild gas, coughs and muscle spasms – seem to be where its strongest powers lie. I can vouch for thyme's tummy-taming ability from experience. A few years ago, I visited France and the long hours of travel twisted my stomach in knots. My host, a local farmer's wife, brought me a small bouquet of thyme to chew. And I soon felt better. Basil and oregano are essential ingredients in Italian dishes, and cilantro is critical to many Mexican recipes. And they're good for you. Oregano contains anti- oxidants, basil has antibacterial properties and cilantro may act as an anti-inflammatory agent. At the end of the summer, just dig them up and plant directly in a container suitable for indoor use. Have a bounty of late-summer basil? Make pesto! If the cilantro goes to seed before you harvest all of it, no worries. The seeds are coriander and deepen flavors in Indian and Mexican dishes. Calendula (or pot marigold) is an annual with beautiful, edible yellow or orange flowers that can be tossed into salads. But its real forte is as an easy-to-make herbal salve. When the flowers are barely past full bloom – fully opened and the petals uncurled – pull off each petal the way kids do with daisies (‘loves me, loves me not') and drop them into a small jar of good olive oil. Cover and put it in a cool, dark place. This salve soothes chapped lips, scratched hands and any other irritated skin. In fact, the German Commission E (considered the world authority on herbal remedies) has approved calendula for healing cuts and burns. Calendula salve was more effective than steroid cream in reducing ‘skin toxicity,' a dry, itchy, painful skin inflammation in breast cancer patients, reported the Journal of Clinical Oncology in 2004. Interestingly, with all the prescriptions my husband has received for an eczema-like skin condition, he keeps coming back for my homemade salve. Calendula is about as easy to grow as plants get, whether you start from seeds in the garden or buy young nursery plants and pot them. It likes lots of sun and well-drained soil, but it will tolerate less-than-ideal conditions and still bloom all summer and fall until the first hard frost hits. Herbs are amazingly generous – they can give you richly flavored main courses, garnishes and side dishes and medicines for inside and out. Even if you consider it a stretch to call yourself a gardener, you'll find it no problem to grow these little wisps of life. And you'll be glad you did.